On July 1st, a week after completing the Muskoka 5150, for a first training ride, I got a flat tire. Which cut that ride short. I tried to fix that tire, but when I packed my bike for the next weekend, I noticed another flat; so much for my repair job. I opted to get the tube replacement done professionally and bought a set of new tires as part of it. Things were looking good. I have an adjustable goose-neck (a.k.a headset) that lets me have my handlebars a little higher which is easier on my neck when I'm in aero-position. I had lowered it a few weeks ago to improve how aerodynamically I can ride. We were invited to my father-in-law's place for dinner, so I opted to take my bike for what should have been a 13km ride. I found that the handlebars kept dropping every time I hit a bump - I could pull them back up to a reasonable position, but all this would do is wear out the threads on the adjustable goose-neck. I cut the ride short before I flew over the handlebars and called for a pick-up. I tried to fix this problem by re-installing the original headset, but I must have gotten things wrong, because I ended up with handlebars that wouldn't turn. Another stop at another bike shop. All set up to make my final pre-race ride, right? Wrong. After 8km on Saturday, the skies opened up and drenched me, and Papa won't risk skidding out on the road a week before the race. I ended up making that one up the next day, but Plan A of having both a ride and a brick on the same long weekend was ruined. I haven't done any transition practice either. I may play a little with getting my bike shoes on and off and mentally re-hearse/visualize my T1 steps this week. My final open-water swim didn't feel particularly strong, but the numbers actually looked pretty good over 2km. Getting the wet-suit on and off wasn't as bad as I remembered either. The Bracebridge Olympic Triathlon swim is a single loop in the Muskoka river. Though the 5150 swim course has some current, I don't consider myself an experienced river swimmer. I might try and compensate for the current when crossing the river, but overall I hope the challenges give the rest of my age-group more problems than me, and I come out a little ahead. ; that's the best I can hope for. 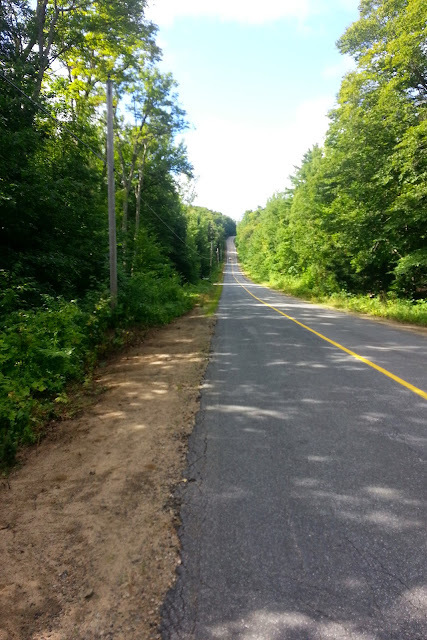 The big hill on my last ride. To get a sense of scale, look for the car in the pic. I wore compression socks for the first time while riding (I haven't loved them for running yet) this past weekend, and I could swear they made me feel a little stronger. Putting them on for race day will make for a slow T1, so I'm not too sure whether or not I'll wear them. I'm not really bad on hills altogether, I think my bigger problem is staying focused and maintaining the right pace after 30 km or so. The ride promises to be scenic, which can enhance my enjoyment, and I'm glad to see it's keeping us away from Highway 11 and its bridges/ramps. I managed to do a brick (bike/run) using my Merrell Trail Gloves without damaging my Achilles' tendons. This course doesn't seem to have any trail components, so wearing my Salomons might be overkill and maybe I can get away with my Zoot racing flats. On the other hand, having some cushioning generally lets me be a little more reckless in my pacing. I'll bring both and follow my gut on race day. As an official 'Redemption Race' to make up for not making it to the starting line last year, things are looking bleak - any sort of PB is pretty unlikely here. Trying to be positive means going to the race site, grateful for the fact that I can do this kind of thing at all, and have fun while I'm out there. I'm going to channel my inner Phaedra from Blisters and Black Toenails while on the course; she's been killing it and racking up age-group podium spots all season. I don't have to have that result to have that spirit, do I?